Butterball turkeys are always tender and juicy because we take the extra step of individually pre-brining them based on size. We pre-brine directly in the breast meat ensuring you can take the turkey from the packaging to your pan without a lot of additional preparation before cooking and enjoy the most tender and juicy turkey possible. Every Butterball turkey comes with an easy to read instructional insert with step-by-step cooking instructions – from thawing to cooking times and temperatures we help guide you through the whole process. If you accidentally toss the instructions you can always call 1-800-288-8372 or Contact Us for additional help. Our giblets come in a cook proof bag. If you accidently leave them in while cooking, the turkey isn’t ruined or if you choose to remove them the bag makes the removal process easier! It’s happened before and will happen again, so rest assured Butterball’s thought of that feature just in case you forget the giblets. No need to wrestle with the turkey to get it out of the packaging this holiday! Our easy open packaging makes it easy to remove the turkey in one quick step – so put away the scissors and knives. Just pull the tabs apart and you’re ready to begin the cooking process with no mess. 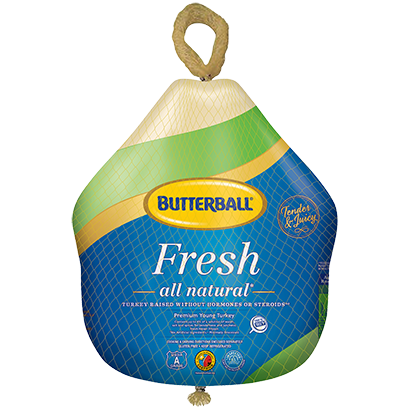 With more than half of holiday cooks stuffing their turkey, Butterball turkeys have a natural leg tuck using the skin to hold the legs in place and make it easier to stuff. 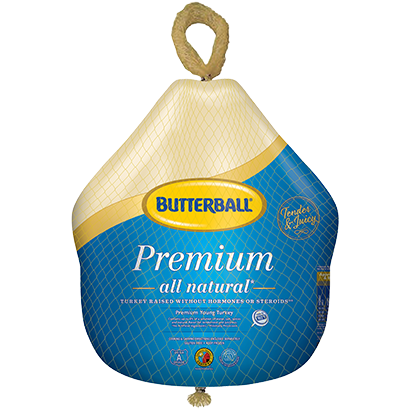 There are no plastic or metal locks in a Butterball turkey ensuring you won’t have to worry about a hot metal clip when you remove your stuffing. Butterball has been awarded American Human Certified® status from the American Humane Association. www.humaneheartland.org. 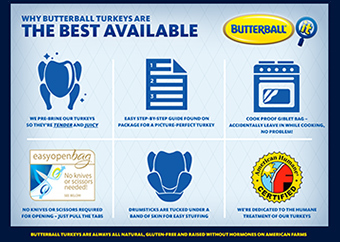 Visit our Calculators and Conversions page to determine the size of Butterball turkey needed for your holiday meal.